I bought Paper Mario late last month and I must say, I love it even more than the original Super Mario RPG! The game and characters have a lot more depth (which is kind of ironic, given that they're paper cut outs) than the original, and the puzzles and minigames are more fun. I think the part of the game that finally told me this game would be one of my favorites what when Mario gives the cake to Gormet Guy in Shy Guy's Toy Box. I almost fell to the floor laughing when Gormet Guy began running all over the screen. I think it was one of the funniest things I'd ever seen in a video game. just wanted to say I really like the new look, good job. I just love Toasty64's artwork! I just thought that he/she should be mentioned in the mailbag. You guys are lucky to have such a talented artist submit so frequently! Hi, I saw that someone told you that there was an episode of Dexters Laboratory that had a Luigi look-a like. I just had to say that tehre was another episode and the guy looked like Mario, I don't remember what it was called but he was a electrition. I hope that helped some. Oh yeah, I forgot to add that in an episode of Son Of The Beach, Mark Hammil discuises himself as a pizza delivery guy and he looks like Mario, and then Notch Johnson goes HEY THAT'S SUPER, MARIO! Can I have a picture of the TMK Staff? Tell me who's who. Okay? Paper Mario is fun,but it would be better if it were a real sequel to SMRPG (that has Mallow and Geno...) Wen's Mario Party 3 coming out and how much is it? PS: I can do the yen sign too! MEGAß¥TE: �, and all likenesses are � & �, MEGAߥTE. Violations of this fact have been reported to the US Copyright Office, and the US Patent and Trademark Office. Therefore, you will have to wait for future mailbags to see all of the pictures of the TMK staff; all I'm going to give you is JJ's silhouette. 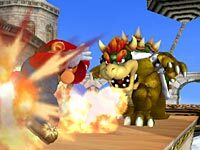 Mario Party 3 should be out with a cost of 5,800�. I checked the Super Mario Bros. The Movie section on the site...I was just wondering. Did you notice that the guns that are used later in the movie are modified SNES Super Scopes? I thought that was cool, I had to watch the movie a second time to notice. The movie wasn't bad when I saw it in theaters, but when I rented it about two months ago, I laughed at how horribly stupid it was. When Mario and Luigi first arrive in the alternate demension place (forgot what it was called) this guy is riding his bike. He then procedes to smash in to the wall, FOR NO REASON, and flips off his bike just to be thrown off the ledge, screaming all the way down. That was the funniest part of the movie, just because of it's nonsensicalness (that's not a word...) Anyway, keep up the great work on the site...sorry this wasn't really a question. MEGAß¥TE: It's gonna be like a Mario game. Like Mario 3. What the hell are you doing on TMK, Mr. Face? Shouldn't you be on Nintendorks? Mr. Face: Mr. Face say read next message. Mr. Face NE-VER wrong!!!! WOW things have changed sinse the last time I was at this sight. Oh hey, Deezer,David,MEGABYTE,J.J who in the heck is the that kid with the gun on the search page? I've got to tell you guys something about that person that is so called -Hairball. He is evil (NO JOKES) this guy has a Mario site called Mario 128 it is good but the people there are crazy. Have you ever read there mailbags. TALK about sick people. I read the other mailbag in this site and it said the THE GAMECUBE is going to be canceled HELL no not GAMECUBE. This is the best system in the making. I hope they will have great games and little movies in them that at least you can see them move their mouths(Ever checked Super Mario 64 their mouths don't move when they are talking). And last but not least they better MAKE Sonic games in GAMECUBE because he is nintendo now(Just like in the old mailbag at this site it says that sonic came back from the darkside, Beware of the Darkside). Great Site!!!!!! keep me updated, See ya.....until the next time!!!! MEGAß¥TE: For the second time, it's Elian Gonzales. The caption says so. Also, I'm including this comment by Rory Griffin regarding the Gamecube. "I read the article on Yamauchi and what he said about Gamecube. He is, obviously, a man who leaves room for an understanding that things may not go well." "Thrid party companies and even people directly involved with development of Gamecube believe it to be the greatest console yet. Some even go so far as to say it may win the "console wars" for the next gen systems. Yamauchi said those things mainly because the games that are being worked on may not be ready for a release at E3, so they won't have much to show. However, it's not what they have ready at E3 that will bring the consumer, it's the quality of a game, and Yamauchi knows that." "He obviously sees the glass half empty AND half full. He understands that things could possibly go wrong, and he dosn't really mean to scare people. However, the fact that if something happened and production stopped, there really isn't a nice way of putting that information without causing an uproar." Of course now that the system has been showcased at E3, I don't think there's any question about it NOT being canceled. MEGAß¥TE: Most emulators have a screenshot option built in. If not, the Print Screen button usually works. I don't think we've ever had to take any shots from the TV, but video capture cards or devices works nicely. *Nintendo is secretly working on a secret "communications" game called "animal forest" were you get a job (Great concept Nintendo) make friends were it's like an RPG without fighting. But that's beside the point. in each house there is a NES and an SNES. Do you know if there are any mario games on it? ****Acording to IGN there is no mario 128 but there is a Lugie's mansion. is this true? ******If some of the mailbags E-mails don't get answered can they be answered in later mailbags? *******Are you ever updating YKYPMGTMW...? YOU probably have thousands by now or maybe that's why your not. 1. Yeah, read the news. 2. You should stop trying to find the secret page. 3. A character from SMRPG.. maybe he knows where the secret page is. 4. No, actually they've updated, and there will be BOTH, but it's not Mario 128 for crying out loud. Where's the Koopa kids now? And when are you gonna upload the NES SMW rom? P.S. :The NES SMW rom only work on rew,a GB/NES emulator. MEGAß¥TE: They were last seen in Antarctica. Today. No, there are plenty of others that run it. Hey, I've been thinking about Super Mario Bros. 2 and Yoshi's Island. The Shy Guys appear in both games, right? Well, maybe the Mario in SMB2 had a dream about Shy Guys because he sort of remembered it from when we was a baby on Yoshi's back. Anyway, I was just thinking. You can't remember everything when you're a baby, but maybe it's possible to remember with a dream. MEGAß¥TE: You're thinking too hard. Do you when either Paper Mario or Mario Party 3 is coming to Australia? MEGAß¥TE: Aussies speak Engrish too. Hi! I have some questions about various Mario games for the SNES I would like answered, please. 1. In Super Mario World, I noticed some castles and fortresses have these killer spikes that fall from the ceiling or rise from the floor. What is it that makes them always fatal if you are caught under one (or over one)? 2. In Super Mario Kart, how many shortcuts are there that do not require a Game Genie, on any track? For each shortcut, please give me the difficulty of doing the shortcut(s). 3. Whenever you play Yoshi's Safari in hard mode, what are the differences from the normal mode? Thank you very much. TMK is the authority on Mario sites! 1. If you had a spike of that size hit you, wouldn't you die too? 2. Extreme shortcuts for Ghost Valley 1 and Vanilla Lake 2 are on the codes page. In Ghost Valley 1, you can also hop where the obvious shortcut is, but its extremely difficult. In Mario Circuit 2, you can hop from the speed jump to another jump bar which is in the grass, this will put you past the finish line, but its difficult. All three Ghost Valley's have an easy shortcut if you have a feather. Bowser Castle 2 has a fairly challenging feather shortcut. Feathers and mushrooms can be useful on both Choco Islands, but I haven't listed many of them here. Donut Plains 1, Mario Circuit 3 and 4, and Choco Island 2 have easy shortcuts if you have a mushroom. Rainbow Road has a difficult shortcut using the Mushroom off of a jump, and there are good places to use the Mushroom in Mario Circuit 2, and Koopa Beach 1, off of jumps. Water-hopping is good on Koopa Beaches and Vanilla Lake 2. These are just a few; the maps are in no way complete. Maybe I'll post an in-depth guide someday. MEGAß¥TE: NOA does not tell the whole truth on issues like this. There is no generalization of the legality of ROMs. Commercial ROMs copied from any source other than from cartridges that you own are illegal. However, if you own the cartridges and download ROMs for those cartridges, they can't exactly prove that they aren't your backups. You just can't play the backup and the original at the same time. Also, there are plenty of ROMs that have been released into the public domain, meaning they are legal to have copies of. MEGAß¥TE: You might try reading some of the older mailbags; you would have seen this answered several times. Thanks for posting my letter in the latest mailbag, after J.J. cut it short last time, Deezer. I realize I had made a great set-up for a joke, but it was still frustrating to see the suggestions on the R thing clipped. MEGAß¥TE: It came from a game called "Super Mario Bros. 3" Maybe you've heard of it. Just in case you haven't, I've included a screenshot. And what could this be?!? !